The auto party had taken the route from Johannesburg to Ballarat slowly, stopping to clear the road of large rocks in their path and pausing whenever they encountered a freight wagon to keep from frightening the horses and mules. Because there were only two watering holes on the road, the party had taken an ample supply of water for themselves and the car’s radiator, and they shared some with the teams that they passed. Mrs. Freeman noticed a spot far ahead on the horizon and eventually realized it was a horse and wagon without its driver. Gates got out of the car and walked several hundred yards up the road to capture the horse. The party assumed that the animal hadn’t gone far in the heat because it wouldn’t drink much, although a dog following the wagon was nearly dead of thirst and drank two quarts of water. Gates wanted to drive the wagon back down the road in search of the owner, while Mr. Freeman preferred sending the driverless horse on its way with a note attached to the harness advising whoever found it to care for it, which is what they did. Five miles farther, the party came across a large bush placed across the road next to an old prospector lying behind a greasewood bush. “Like a wild man, he staggered to his feet. He could not talk, neither could he stand erect, but seldom does a man show so much joy in his face as did that old man. He seemed to be afraid the automobile would rush on and leave him there,” The Times said. 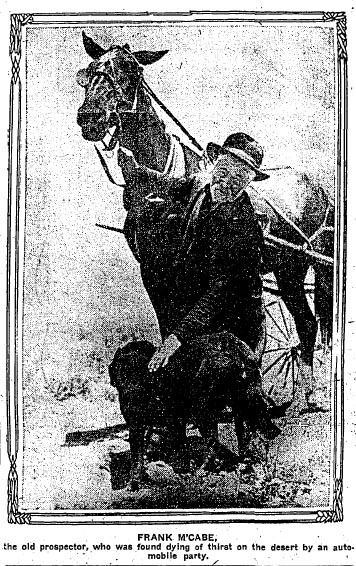 While Mr. Freeman wanted to leave a canteen with the old man and head on, Gates prevailed on him to lift the man into the car, turn around and overtake the horse and wagon they had passed earlier.